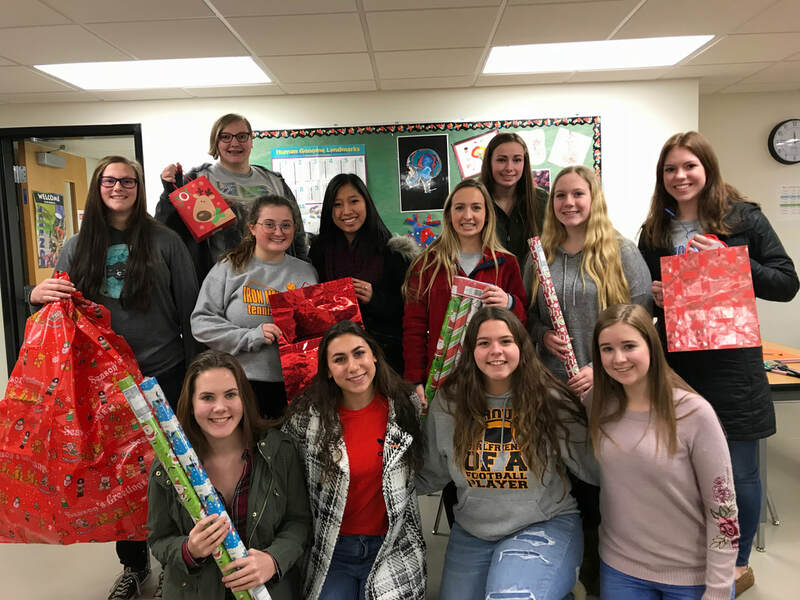 Iron Mountain's Tri-Hi-Y Club recently participated in the Salvation Army's Angel Tree Project. Club members donated gifts and necessities for six children and three local families to help make the holidays bright. ​IMHS Tri-Hi-Y members are helping to make a little girl's wish come true. Allyson Peterson's story was featured on TV6 News back in February. The Houghton youngster's wish is to have 1000 cards for her birthday on April 28th. 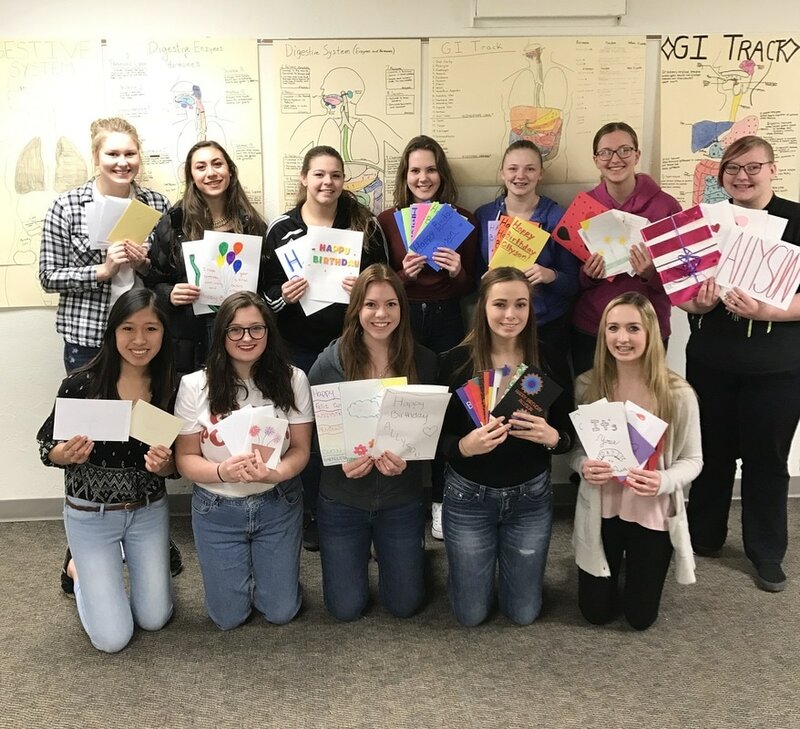 Tri-Hi-Y members sent over 200 cards to add to her collection. More information about her wish may be found on the TV 6 News Website or their Facebook group page. 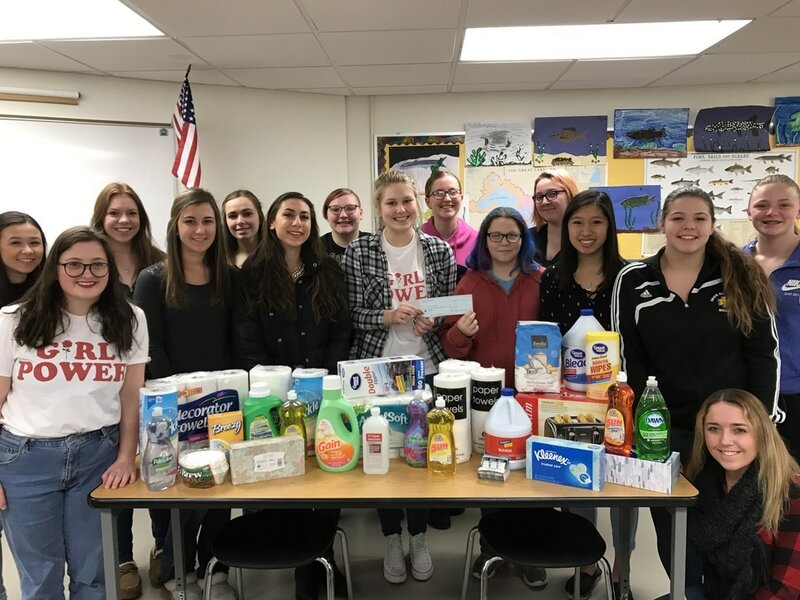 ​Iron Mountain High School Tri-Hi-Y members are shown here with their donations for the Caring House. Club members used their 50/50 raffle proceeds from a basketball game this winter, along with other cash donations, to provide a $175 check to the organization. They also collected supplies and items that were on the Caring House "Needs List". Our club members are proud to support the needs of various local organizations in our community. Iron Mountain High School's Tri-Hi-Y held a UP Regional Blood Center Blood Drive for students and staff. A big thank you goes to all who participated! Iron Mountain High School’s Tri-Hi-Y Club would like to announce to the Iron Mountain Central Middle & High School student body that the Clothes Closet is now open for students in need to use. There is a variety of clothing available including jeans, dress clothes, shirts, sweaters, jackets, hats, mittens and shoes for both guys and girls. School supplies are also available to those in need. Many students in both the Middle and High School have taken advantage of this service, so please do not be shy to use the Closet if you are in need. The Closet currently accepting school supply donations only. Donations can be dropped off to the IMHS Guidance Office M-F from 7:30-3:30. Receipts are available for tax deduction purposes. Tri-Hi-Y members are proud of what they have accomplished to reopen the Clothes Closet in a brand new space after the renovations last summer. For questions about the Clothes Closet, or to use the closet, please contact Rhonda Carey, Tri-Hi-Y Advisor, or Bonnie Greenleaf, Guidance Secretary, at 779-2610. Thank you for all the support!